The culmination of 30-years of experience designing data acquisition and control systems has resulted in this extremely versatile unit. The Microlink 840 lets you perform a multitude of data acquisition and control tasks, all in one small box. You can use it anywhere on an Ethernet network or over the internet. 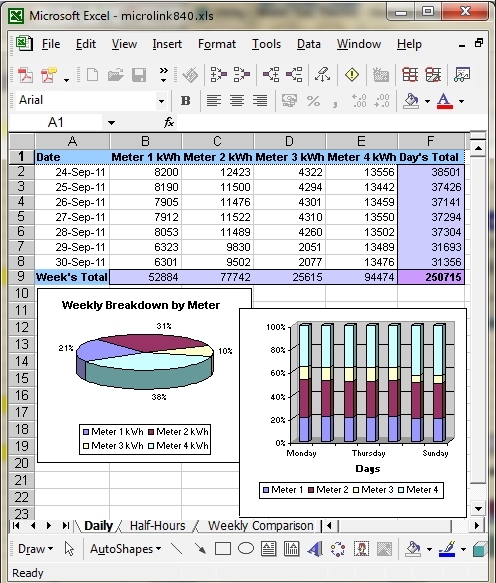 Log data from gas, electricity and water meters and send the consumption readings to a central PC running Windows. The Microlink 840 lets you monitor demand in real-time and identify patterns of use. Continuous monitoring, logging and display using Windows software. 16-bit or 32-bit counting: 16-bit allows counting up to 65000; 32-bit allows counting to over 16 million. Set a scale and offset factor to the count from software. For example if the pulses came from a flow meter which produced one pulse for every 50 millilitres, a scale factor of 0.05 would give a reading in litres. Data can be saved in text files, xml files, Energy Lens files and to a MySQL database over Ethernet or Internet. You can also automatically e-mail data and reports, and send data to other applications like Word or Excel. For more details please get in touch. 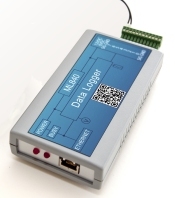 You can also download the Data Logger leaflet or Microlink 840 Manual.